"If you knew Peggy Sue, then you know why I feel blue...without Peggy, my Peggy Sue." Peggy Sue, a beautiful fawn female, started life as a West Texas gal not too far from where her famous admirer, Buddy Holly, was born. 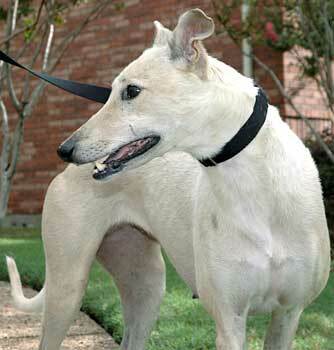 Venturing into Amarillo one day, Peggy Sue was picked up as a stray and temporarily fostered there by a GALT family until she could make her way to Dallas. Without tattoos to confirm her age or background, Peggy Sue's start in life is a mystery, but her age is estimated to be at least 6 years. Friendly and very outgoing, Peggy Sue doesn't know a stranger and talks a blue streak with her wagging tail. She's a bit fuzzy-haired at the moment, an indication of having spent life outdoors, but Peggy Sue is a natural blonde and is already showing the benefits of air conditioning and a soft bed. Despite the fame awarded a lady who inspired a song, Peggy Sue has chosen to forgo her celebrity status in favor of finding her family. At a recent interview, she let it be known that her focus has shifted from signing autographs to learning house manners. 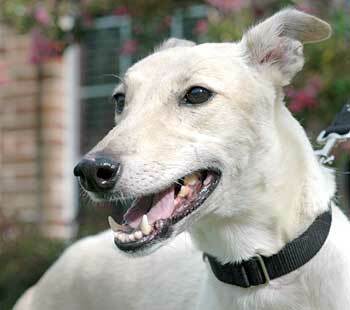 She gets along will with other Greyhounds but is not small animal tolerant. Peggy Sue is a golden girl with a white underbelly. Although very fuzzy when she was found as a stray, she now has a sleek blonde coat. Her face is made all the more charming by her black eye liner and the black around her mouth. Peggy Sue is very outgoing and people friendly. She loves to be around people and seems to be good with children. When anyone approaches her, she will wag her tail and then lay down to be petted. At one of the Tornado's Hockey games, she was surrounded all evening by a group of young men, all of whom wanted to pet her. She proved the adage, "Blondes have more fun." She just couldn't seem to get enough petting. She is cautious around new dogs, but once she knows the other dogs, she gets along very well with them. Noah, her house mate, is her best buddy. Peggy Sue gets along very well with our dog and they often sleep close together. At night, she sleeps in her own bed. During the day when she is left unattended, she sleeps in her crate with no problems. Peggy Sue can be left in her crate with no potty problems. Peggy Sue is, however, not small animal tolerant. 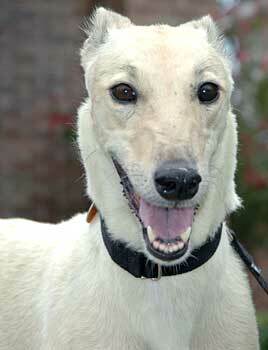 Peggy Sue loves to go for long walks (2 or 3 times a day if you will take her). She walks well on a leash without getting too distracted. She is very cautious when large vehicles approach her while she is walking and tends to move closer to us. At the end of her walk when we are approaching the house, she tends to slow down; she would love to stay outside longer. Maybe this is a holdover from her days as a stray. Peggy Sue's kitchen manners are very good, and she does not beg for food. At meal time, she will just lay down near the table and sleep. For her meals, she is very patient and waits for them to be prepared. She loves her treats, and is very gentle when fed by hand. Peggy Sue is a sweet dog who loves to cuddle and always has a tail wag. At the same time, she also enjoys her quiet time alone. She's a typical greyhound.